A perfectly fine novel in its own right. Trouble is, It invites too much comparison to the works of a certain Francophilic and Francophone Irish writer named Beckett and therefore sets itself a bar rather too high to reach for most of us mere mortal writers. __Milligan and Murphy__, then, can only be made the worse for the comparison with Mr. Beckett. A better technique, perhaps, would have been to have chosen unowned Irish (or better Patagonian or Portugese) surnames, avoided an epigram from __Mercier and Camier__ and feigned a beguilingly innocent originality: then critics (and imitation critics like myself) might have been happy, jubilant even, in discovering for themselves a bit of Beckettian similarity in the novel that they may have found praiseworthy. Instead, I feel saddled with this comparison, frustrated that I can't like __M & M__ more than I do. 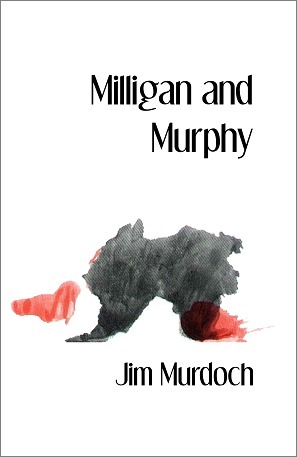 On the bright side, I enjoyed reading __Milligan and Murphy__ for itself as an entertaining tale, but also because it helped me to clarify for myself exactly why I believe Beckett to be one of the best, if not the best, writer to have ever written in the English tongue: his use of language. This also, perversely, becomes the crux of my disappointment with __M & M__: the novel's language, although perfectly serviceable for the particular tale that it tells, in no way approaches the explorations in rhythm, meaning, ambiguity, and, ultimately, simplicity, that mark the best of Beckett's works--particularly those of the '70s on, beginning with the stunning __How It Is__ and wrapping up with the late __Nohow On__ trilogy--perhaps my favorite all-time read in English prose. I am, of course, like all readers, complicit in this pseudo-judgment of __M & M__. As an author with enormous literary pretensions myself about to self-publish a collection of my own verse and prose, I set out on an internet search of authors similar to myself who have also self-published and was quite impressed with Jim Murdoch's blog. He is smart, literate, literary, and at a glance, we seemed to share a love for some of the same authors--notably Beckett, so I gleefully ordered __M & M__--such a situation certainly set me up for disappointment, as optimistic discoveries often do. Still, attempting to leave this unfair--although invited--comparison aside, __M & M__ is, as I have said, a fun read. It's entertaining, quite funny in parts, economically constructed and written, with a few dashes of philosophy and meta-narrative thrown in (particularly towards the end) to spice up what is a drab story--as it is surely meant to be, mirroring the world in which most of push on, repeating the same provincial/capitalist tasks day in and day out--these too, although not quite as hopeless as the often inhuman blobs laying in the dark of Beckett's later works, are akin to his earlier semi-comic vagabonds such as Watt, Murphy, Malone and The Unnameable. It is difficult to attack the dreariness of the human condition in a dramatic way--seeing as such a life's lack of drama is rather the point--so Murdoch deserves praise for succeeding in writing about boredom and futility in a manner that is neither boring nor futile. Lastly, although not as exciting or useful to me as Beckett's linguistic pyrotechnics, Murdoch is kinder to his characters than Beckett is and is probably, therefore, a much nicer fellow I imagine. There is something to be said for that. Sign into Goodreads to see if any of your friends have read Milligan and Murphy.